May 17th, and subject to availability. 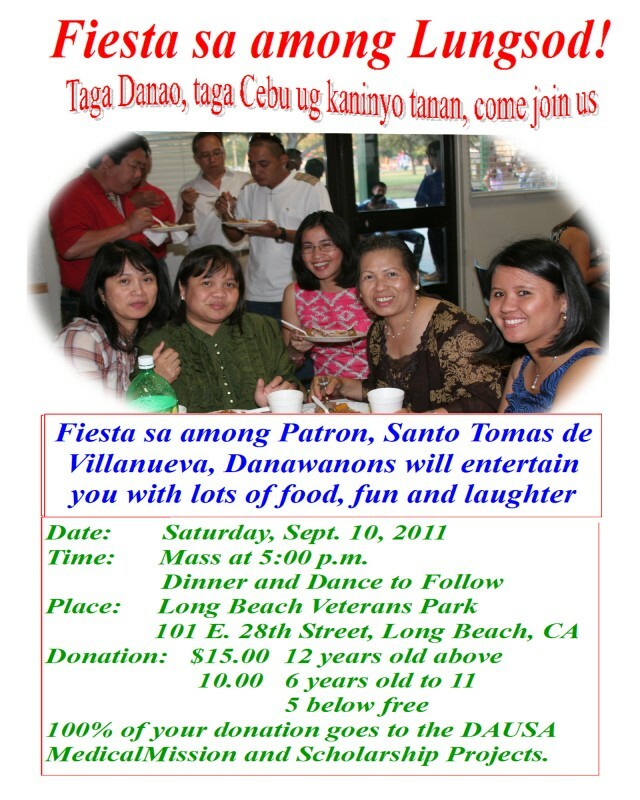 If interested, please call Mae at Citi Tours at (213) 487-1227 to book. MEET YOUR FRIENDS AND RELATIVES! 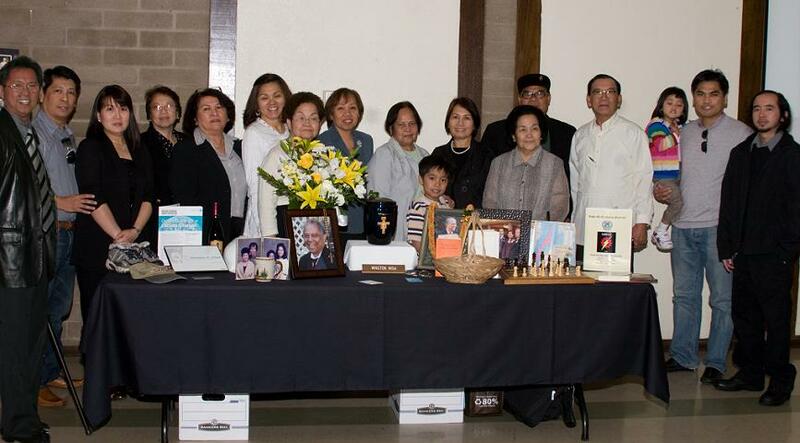 A number of DAUSA members took a respite from a long Thanksgiving weekend to pay their last respect and attend the memorial service of a good friend and fellow member, Winston Misa held Saturday, November 30, 2009 at the St. Peter and St. Paul Catholic Church in Alta Loma, California. Winston was the husband of Pat Osmena-Misa, DAUSA’s first Educational Mission Coordinator. The Misa couple was the first to come forward when the Adopt-a-Student Project was initiated in 2000. They readily volunteered to sponsor 10 DAUSA scholars who all graduated from a 4-year bachelor’s degree in Education from the Cebu State College – Danao City Campus. Because of their admirable example others followed, and to date over 50 students have been helped and currently employed, mostly as public school teachers. CEBU, Philippines – “Everybody dies…Nobody dies.” In deep pain, I write for the sudden passing of a friend of mine, Winston Escanilla Misa, president of the KMTri-E Foundation. He died on November 13, 2009 while on vacation in Spain with his wife, the former Pat Osmena, a close relative of the Almendras clan of Danao. He had a heart attack. Death came like a thief in the night. Pat lost a soulmate and their daughters Kim and Pearl lost a loving father. I lost a dear friend. When death came, Winston was 66 years old. “Everybody Dies…Nobody Dies.” Winston was a professed conservative and I will always be a liberal. But it never bothered us. We talked of things that unite us rather than of things that divide us. Winston was smart and bright. He can discuss in an intelligent and rational way what works and how to make it work. He can grasp and understand the writings of Stephen Hawking about how the universe came to be and could understand what Mark Twain wants to convey in his works. He went to UP Diliman and then finished his Mechanical Engineering degree at USC. He joined General Milling Corporation in Lapulapu City after passing the board in 1965; sometime in 1969, the family migrated to the U.S. He studied for a time at UCLA and took the Professional Engineering (P.E.) California State Examination. He was a licensed California P.E. At the time of his death, he was connected with HMC Architectural and Engineering and was tasked in evaluating and assessing drawings, and writing engineering specifications. He will be missed…and he will not die as long as he is remembered for his works….the underground subways in Los Angeles, the international airports in Ontario and Los Angeles Airports, the Kaiser Hospitals, and various school constructions. The 12th DAUSA Medical Mission held simultaneously at the Danao General Hospital and at the air-conditioned Danao City Civic Center drew a huge crowd seeking help from volunteers for consultation and free medicines. 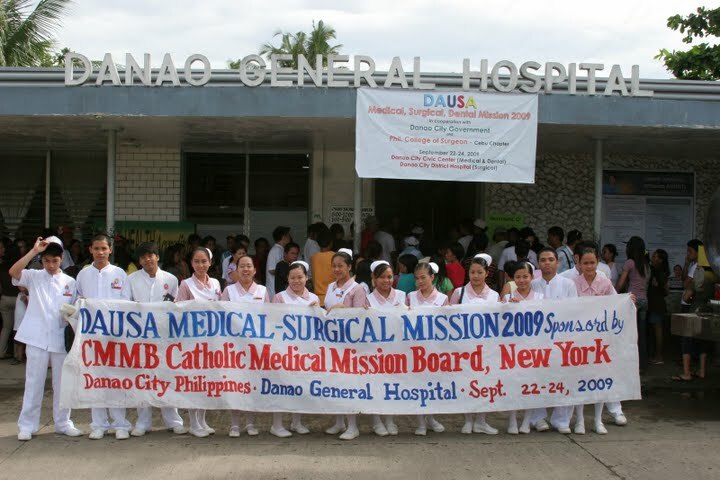 Over 20 DAUSA members and officers led by the new DAUSA President Marietta Palos and Chief of Medical Mission Dr. Anita Cal-Jackson actively actively helped out doing their share in making the 2009 Medical Mission another huge success. The DAUSA Medical Mission has always been a big success, since it started in 1998. It has become an institution and eagely awaited by people who cannot afford to go to Cebu City for treatment or to any private medical clinics, especially those needing surgical interventions. A team of surgeons from Cebu Doctors Hospital, this time led by Dr. Marlo Cal Batucan, tirelessly worked until late in the evening to meet their own target of doing life-saving procedures for some 30 patients lined up for major surgeries during the 3-day period. Although there were some hitches that delayed operations due to malfunctioning anesthesia machine, yet they made it up by working until midnight after it got fixed. The 12th DAUSA Medical Mission got the bulk of medicines from the Catholic Medical Mission Board of New York, which donated 980 lbs of medicines, and some from IMA World Health of Maryland and MAP International of Georgia. Meanwhile, all volunteers will be treated at noon today, Thursday, to a “Lunch at the Farm” in Taboc, Guinacot, Danao City, hosted by the Barriga and Tomayao families.